Puromycin is an aminonucleoside antibiotic that causes early chain termination within the ribosome during translation. This inhibition of translation is effective in both in vivo and in vitro applications, making it an ideal tool for protein synthesis studies. While selection for E. coli cells is possible with puromycin, it is more commonly and effectively used for mammalian cell selection. The growth of bacteria, protozoa, algae and mammalian cells is quickly halted by puromycin. However, cells with the pac gene have resistance. Its gene product is puromycin-N-acetyl-transferase which inactivates puromycin through acetylation. Research has shown puromycin to be effective against certain tumors. 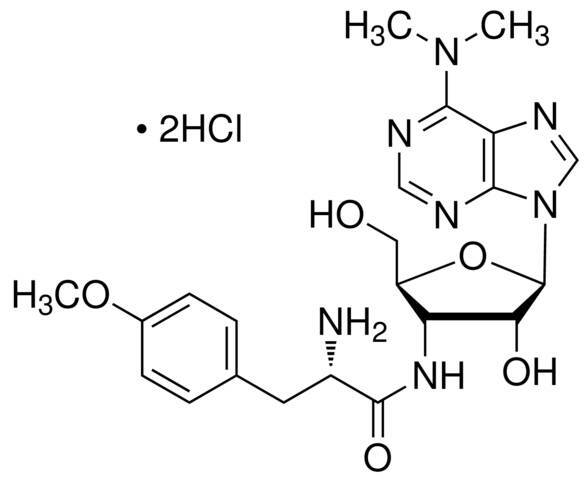 Puromycin is soluble in water and is often used as a selective agent in molecular biology research.